Sekita brings in-depth knowledge of climate and energy issues, with a particular focus on policy development and regulatory frameworks, to her work on BSR’s Advisory Services team. Among other projects, she leads research for BSR’s Future of Fuels initiative and manages projects for Future of Internet Power. Previously, Sekita worked for the California Energy Commission as a policy advisor to the chairman on climate, transportation, and legal matters. She has experience working on international environmental projects in Latin America and the Caribbean for major environmental NGOs and government agencies. 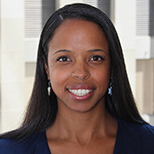 Sekita has also worked as a commercial litigation attorney for a law firm in California. Sekita holds an LL.M. in Environmental and Land Use Law from the University of Florida, a J.D. from the University of Southern California, and a B.S. in Management from the Georgia Institute of Technology.